Construction on the recently completed 893 kilometer long Gwadar-Ratodero motorway, also known as M8, was started by a Chinese contractor back in early 2004 on former President Pervez Musharraf's watch. The work was soon abandoned when three Chinese engineers were killed by a car bomb during the first week of May, 2004. In 2003, a year before this incident, Indian intelligence agency RAW had recruited Kulbhushan Jadhav as an undercover agent. He was issued a passport under an assumed name of Hussein Mubarak Patel and sent to Chabahar in Iran to orchestrate insurgent attacks next door in Balochistan. After the Chinese left the project, another contractor who was awarded the project could not continue M8 construction. Eventually, Pakistan Army's Frontier Works Organization (FWO) completed the project 13 years later in 2017. This success has come at great cost in terms of time, money and human lives. FWO has lost dozens of military and civilian employees and many more have been injured in insurgent attacks. Meanwhile, a combination of military and intelligence operations by Pakistan Army and serious infighting among militants have significantly weakened the Baloch insurgency. 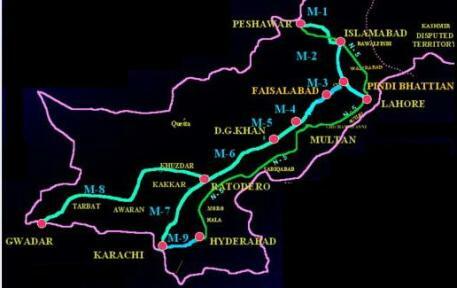 Local Baloch residents now use M8 motorway on a daily basis. They say it has significantly reduced the time needed to travel from Gwadar to Turbat, and indeed, reduced the time for produce and supplies to be transported between cities, according a report in local Pakistani media. The current Baloch Nationalist revolt in Pakistan started in 2003, the same year that Indian intelligence agency RAW recruited Kulbhushan Jadhav and gave him a new identity as Hussein Mubarak Patel, according to Indian media reports. This was three years before the killing of Baloch leader Akbar Bugti on August 26, 2006. Jadhav was sent to Chabahar in Iran to orchestrate insurgent attacks next door in Balochistan. Kulbhushan Jadhav was arrested in Balochistan in 2016. He has confessed to orchestrating insurgent attacks on targets in Balochistan that resulted in deaths, injuries and destruction of property. India's former RAW officers, including one ex chief, have blamed Indian spy Kulbhushan Jadhav, arrested by Pakistan in 2016, for getting caught in Pakistan as a "result of unprofessionalism", according to a report in India's "The Quint" owned and operated by a joint venture of Bloomberg News and Quintillion Media. The report that appeared briefly on The Quint website has since been removed, apparently under pressure from the Indian government. It is believed to be the strongest and longest of the insurgencies seen in Pakistani Balochistan which has had earlier bouts of it in 1948, 1958-59, 1962-63 and 1973-77. Baloch insurgency has been significantly weakened recently by the continuing military and intelligence operations of the Pakistan Army. The other probably more significant reason for it is serious infighting among insurgent groups from various tribes, according to pro-insurgent US-based Baloch analyst Malik Siraj Akbar and a former US military intelligence officer retired US Lt. Col. Ralph Peters who supports Baloch insurgency. The Frontier Works Organization (FWO) is a branch of the Pakistan Army that employs both active duty military officers and civilians. It was commissioned in 1966 and its first major project was the construction of the Karkoram Highway, the world's highest road that connects Pakistan with China. Since then, the FWO has built motorways, bridges, roads, tunnels, airfields and dams in Pakistan. FWO has successfully completed several large construction projects in some of the most hostile conditions ranging from rough hilly terrains to insurgency-hit parts in Balochistan and federally administered tribal areas (FATA). This success has come at great cost in terms of human lives. Dozens of FWO's military and civilian employees have lost their lives and many more have been injured in insurgent attacks. Currently, FWO is engaged in several large infrastructure projects related to China-Pakistan Economic Corridor. In addition to major road construction, FWO is building housing, water projects, power plants and oil refineries in different parts of the country. Various militant groups, including Indian government proxies, are engaged in sabotaging CPEC. While some attacks have been successful, it is believed that the Pakistani military has been able to prevent many more. Thousands of soldiers and hundreds of intelligence officers are believed to be working to manage the security situation all along the western route and in Gwadar. The construction of the recently completed 893 kilometer long Gwadar-Ratodero motorway, also known as M8, was started by a Chinese contractor back in early 2004 on former President Pervez Musharraf's watch. The work was soon abandoned when three Chinese engineers were killed by a car bomb during the first week of May, 2004. In 2003, a year before this incident, Indian intelligence agency RAW had recruited Kulbhushan Jadhav as an undercover agent. He was issued a passport under an assumed name of Hussein Mubarak Patel and sent to Chabahar in Iran to orchestrate insurgent attacks next door in Balochistan. After approval of its PC-I, procurement of the project will be initiated .The road is part of proposed 933 mm long Federally Administered Tribal Area (FATA) Highway and feasibility study is initiated on the alignment proposed by the FATA Secretariat. The project will be part of FATA Highway. The project envisages the construction of two-lane highway as per NHA specifications. Rs 250 million for conducting the feasibility study and design.The construction period of project will be 24 months. Ahmar Mustikhan, a pro-insurgency Baloch activist based in Washington D.C., has released a video recorded in Urdu in which he has lambasted Indian intelligence agency RAW for letting him down. Mustikhan has been part of Indian sponsored media campaign to attack Pakistan in the United States. He is known to collaborate with Tarek Fatah known for his advocacy for Baloch insurgency in Pakistan. He has been in the news for heckling visiting Pakistani leaders during presentations at think tanks in the US capital. Mustikhan says he "was promised huge help by those who were interested in the heckling of Nawaz Sharif. None of those promises were ever fulfilled. There was this gentleman in the Indian embassy who left (for India) in January and never fulfilled his promise. There were other things that happened too," according to Pakistani media reports. "RAW's system is so corrupt that its high officials keep 40 percent of what's earmarked. India should have been engaged in public diplomacy and helping those who are involved in raising the profile of Balochistan issue but while China is trying to build, India is choosing to bomb. India is going in the opposite direction—it should have helped the people who are involved in diplomatic effort," he said. The RAW man he named in his video is Nagesh Bhushan. He says Bhushan worked at the Indian spy agency's Balochistan Desk. Another Indian journalist Aveek Sen has described Bhushan as "media fixer" in a 2016 tweet in response to pro-independence Baloch activist Shah Nawaz Bugti. Sen's tweet said "hello, Mr. Nagesh Bhushan. Introducing the media fixer to the world". A senior Baloch activist claimed on Tuesday that he heckled former prime minister Nawaz Sharif during his 2015 visit to Washington at the behest of Indian intelligence agency Research and Analysis Wing (RAW). AFB’s two Indian supporters — Soumya Chowd­hury and Krishna Gudipati — had filed the appeal, asking the judge to stop Mr Mustikhan from publicly sharing the internal affairs of the group. The court agreed with the Baloch activist’s plea that the US constitution guaranteed his freedom of expression. Mr Mustikhan, who is also a journalist, claimed in the videos that he was “let down” by RAW operatives working from the Indian embassy in Washington. He identified one of them as Nagesh Bhushan who, Mr Mustikhan said, manned RAW’s Balochistan Desk. On Oct 22, 2015, Mr Mustikhan heckled Mr Sharif during his speech at the US Institute for Peace in Washington and was removed by security personnel as he continued shouting for several minutes. He then appeared on a series of Indian talk shows, explaining why he heckled the prime minister. He also heckled other Pakistani leaders, particularly former president Pervez Musharraf. “I did this with a heavy heart, as I have no fight with Nawaz Sharif. He is an elected prime minister,” he told Dawn. Mr Mustikhan said that India was supporting terrorism in Pakistan and this support started after the Kargil war and that’s why the current insurgency had continued for 12 years. The Asian Development Bank’s (ADB) on Monday approved a $100 million loan to address chronic water shortages and increase earnings on farms in southwestern Pakistan province of Balochistan. The Balochistan Water Resources Development Sector Project will focus on improving irrigation infrastructure and water resource management in the Zhob and Mula river basins, the ADB said in a statement. “Agriculture is the backbone of Bolochistan’s economy,” said ADB Principal Water Resources Specialist Yaozhou Zhou. “This project will build irrigation channels and dams, and introduce efficient water usage systems and practices, to help farmers increase food production and make more money,” he added. Among the infrastructure that will be upgraded or built for the project is a dam able to hold 36 million cubic meters of water, 276 kilometers of irrigation channels and drainage canals, and facilities that will make it easier for people, especially women, to access water for domestic use. The project will protect watersheds through extensive land and water conservation efforts, including planting trees and other measures on 4,145 ha of barren land to combat soil erosion. Part of the project’s outputs are the pilot testing of technologies such as solar-powered drip irrigation systems on 130 ha of agricultural land, improving crop yields and water usage on 160 fruit and vegetable farms and demonstrating high-value agriculture development. The project will also establish a water resources information system that will use high-level technology such as satellite and remote sensing to do river basin modelling and identify degraded land for rehabilitation. ADB will also administer grants from the Japan Fund for Poverty Reduction (JFPR) and the High-Level Technology Fund (HLT Fund) worth $3 million and $2 million, respectively, for the project. A separate $2 million technical assistance from JFPR will help Balochistan’s provincial government improve its institutional capacity to address the risks and potential impact of climate change in the agriculture sector, as well as build a climate-resilient and sustainable water resources management mechanism in the province. JFPR, established in May 2000, provides grants for ADB projects supporting poverty reduction and social development efforts, while the HLT Fund, established in April 2017, earmarks grant financing to promote technology and innovative solutions in ADB projects. ADB said it is committed to achieving a prosperous, inclusive, resilient and sustainable Asia and the Pacific, while sustaining its efforts to eradicate extreme poverty. Established in 1966, it is owned by 67 members of which 48 are from the region. In 2017, ADB operations totaled $32.2 billion, including $11.9 billion in co-financing. @ 2018 Results index If the Belt and Road Initiative has a blind spot, it is surely to be found in south Asia. The region is home to one country that can’t get enough of the project (Pakistan), and another (India) that wants nothing to do with it. Does this matter? Well, yes and no. On the plus side, Pakistan, which is chronically short of friends and capital, shows no sign of falling out of love with a project that continues to shower it with financial largesse. The list of Chinese-funded and Chinese-built infrastructure projects is long and impressive. Take the $2.9 billion, 400-kilometre stretch of the M5 Motorway funded by China Development Bank (CDB) and built by China State Construction Engineering. When the motorway is completed later this year, the cities of Karachi and Lahore will finally be linked, by a project that was first drawn up as long ago as the 1990s. CDB is the financial driving force behind many of the big local BRI deals. In December 2017, the policy bank was a key player in a 10-year, $700 million syndicated term loan raised for the finance ministry, a deal that included partial guarantees from the World Bank. It is funding an $883 million coal-fired power plant at Port Qasim. And in April, CDB shelled out $1 billion to a government that, not for the first time, faces a looming financing crisis. Pakistan’s foreign exchange reserves dipped below the $10 billion mark this July, for the first time since 2014. China is unlikely to turn off the spigot, even though the position of prime minister, vacated after the arrest of Nawaz Sharif in July, has been filled by Imran Khan, the former cricketer who campaigned hard against alleged corruption in local China-backed construction projects. Yet Beijing is clearly keen to keep Khan on-side: days after his election, it handed Pakistan another $2 billion, bolstering the perception that however bad its finances get, China will not turn its back on the south Asian state. That should come as no surprise. Beijing plans to spend up to $57 billion by 2030 on a profusion of new domestic infrastructure projects – ports, airports, highways, power plants, transmission lines, solar parks – which are all part of the so-called China-Pakistan Economic Corridor (CPEC). Both can see clearly what they get out of this transactional alliance: for China, a reliable overland route to the Indian Ocean that bypasses the Malacca Strait, and for Pakistan, the infrastructure it always wanted and needed, but couldn’t afford. And so we turn to India, which has, to say the least, a different relationship with its giant neighbour. It was a founding member of the Asian Infrastructure Investment Bank in 2014, and is the second-largest contributor after the People’s Republic, funding the China-led multilateral to the tune of $8.4 billion. It is also a founding member of another multilateral, the Shanghai-headquartered New Development Bank, which is chaired by KV Kamath, the former chairman of Indian IT firm Infosys. Yet India adamantly refuses to be considered a belt-and-road nation. Rafiqul Islam At a meeting of the Shanghai Cooperation Organization in June, India was the only member state that did not tacitly endorse the BRI programme. New Delhi resents the mere existence of the CPEC project with Pakistan, and fears being outflanked in its own backyard by Beijing, which is funding a series of massive infrastructure projects in states that border India, or are historically aligned with it. The question arises: does India need to be part of the BRI project? Abbas sells mangoes from his hometown, known for conditions favourable to food and crops such as mango, cotton and sugarcane, to the southern major port city of Karachi, some 900km away. However, the two cities were connected with a poorly maintained highway, with the whole journey taking about 21 hours. The 392km six-lane M5 is the largest transportation infrastructure project under the CPEC, a corridor linking Karachi and northwestern Peshawar and running through the populated provinces of Punjab and Sindh. The first 33-km section of the M5 was inaugurated in May this year, with a speed limit of 120 km per hour. The whole project is scheduled to be completed by August 2019. “By then, it will take only 14 hours to transport my mangoes to Karachi,” Abbas said. Life took a surprising turn in early 2016 for Bounmy Phonmixay, a 21-year-old young woman in the central Lao town of Kasi, when a team of engineers arrived for a rail project near her home. When she showed up for an interview with Xinhua recently at the railway project site in Kasi, she was wearing the makeup she likes. “I like wearing makeup, but I seldom did it in the past since I didn’t have much money back then. Now I can afford my own cosmetics and put on makeup whenever I want to,” she said joyfully. Is CPEC also a game changer for Balochistan? The railway is expected to be fully operational in 2021, but Bounmy does not worry about losing her job by then. “I have learnt a lot from my work, especially Chinese cooking. When the railway is in place, there will be many people traveling around the station, then I’ll start my own restaurant there,” she said. The Baloch Liberation Army (BLA), which opposes projects linked to China’s Belt and Road infrastructure initiative in resource-rich Baluchistan, issued a statement on Tuesday confirming the death of Aslam Baloch, one of its leaders. “The important BLA commander Aslam Baloch, along with five associates in the organization were martyred in an enemy attack on Monday,” Jiand Baloch, a spokesman for the separatist group said in a statement that gave no further details. Pakistan’s Samaa Television reported that Aslam was killed along with a number of his commanders in a suicide attack in Aino Maina in Kandahar province, Afghanistan, across the border from Baluchistan. Baluchistan, on the borders of Afghanistan and Iran, has rich mineral and natural gas reserves but is Pakistan’s poorest province. The China Pakistan Economic Corridor (CPEC)-funded Multan-Sukkur motorway is likely to be opened for traffic by August this year as work on the project is in progress according to the set schedule, a senior official of National Highway Authority said on Thursday.